A parenting book -- online! Starting Out Right is an online book that discusses how best to help children succeed in reading. It focuses on children from birth through the first years of formal schooling, and offers practical guidelines, program descriptions, advice on resources, and strategies that can be used in everyday life to improve childrens reading and educational prospects. The book is available for purchase but can be read online for free. This primarily text site has a simple design with a table of contents listed on the left side of the page. There are four primary chapters, as well as an introduction, a glossary, and a list of Internet resources. This site is a resource for parents, teachers, or anyone who influences the education and development of young children. 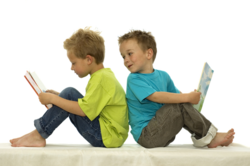 It offers parents help in figuring out what language and literacy experiences to look for in preschools and child care; what to look for in initial reading instruction in kindergarten and the early grades; what to ask school boards, principals, elected officials, and other policy makers who make decisions regarding early reading instruction; and whether their child is making progress in related skills and early reading. Users will also find more than fifty practical literacy and language activities that can be used at home and in the classroom, a list of recommended childrens books, a guide to websites and CD-ROMs, and a glossary that gives basic definitions of unfamiliar reading terms found throughout the text.